COMMENTS FROM OUT THERE – IN DETAIL. I don’t know whether or not we are connected. I shall research further. JUNE BORNHOLT SPEAKS AT TWEED RIVER HISTORICAL SOCIETY ABOUT MCLEODS, BELLS, DINSEYS, QUIRKS ETC. ADDRESS TO T.H. & D.H.S. Inc.
By June Bornholt, 18th February 2003. Transcribed by Gwen Hart February 2003. Good morning to everybody. I am June Bornholt – born – I’m not afraid of my age – born in 1925 and I was named June Mary Dinsey. I would like to tell you what happened to my family in their journeys that we had to find a better place to live, to work and to play – we did that – we’re here. John and Elizabeth Dinsey, born in a small County or borough named Rutland in England – that County has since got another name, but that is where they were. They had suffered 2 or 3 early deaths of children and migrated to the Colony of New South Wales for what reason, we are unsure. They arrived in Sydney on a ship, the “Kate” on the 13th September 1849 and went to the Hunter River where they must have had friends or relatives as they were not Government assisted and I can find no records of John Dunmore Lang or any other person listed as their sponsor. 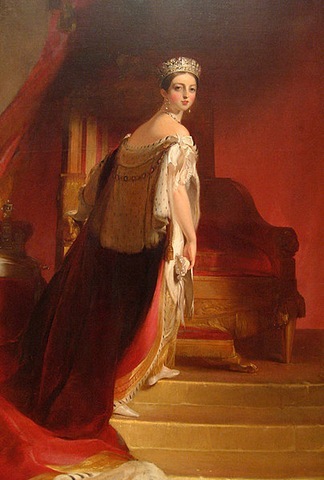 Elizabeth noted on the shipping list that she had two brothers here, George and William Church, who had boarded the “Mary Bannantyne” earlier than the “Kate’s” departure. We haven’t found them yet, so we’re still looking. The family, John and Elizabeth and their boys, Thomas (10 years) and George (7 years) and Emily who was born on the ship, aged 2 weeks old when she was registered on arrival in Newcastle. We have a photo of the ship. They farmed for a time on Foster’s property at Mulconda, a property with two homesteads on it and is near the village of Bandou Grove, a few miles out of Dungog on the Williams River. They farmed in the District for about ten to twelve years. The Minister for Lands appointed Alexander Grant MacLean Acting Surveyor General in 1859 to try and speed the reorganisation of the Department and after the compilation of a Map of New South Wales, which must have been the first one that they had in the Department, which was published in 1861, facilitated the introduction of the Robertson Land Acts of 1862 which opened up the Northern Rivers for Selection so that they could come and select before they applied. During this time, a son, John and daughter Sarah was born. In 1865 my great grandfather, George Dinsey (we’re not sure about the date – it could have been 1864 because he came up a couple of times and some family stories have him coming up and down three times – I don’t think he was that slow) anyway, my great grandfather was accompanied in 1865 by Mr Thomas Robinson. They left the Williams River and journeyed to Lismore. I do not know whether by water or overland, but Mr Robinson decided to select land there, adjoining the present township of Bangalow. It was called Byron Creek at the time, I think. My great Grandfather then continued on alone as his contention was that a water course was necessary for the transport of produce. He arrived at the Tweed after travelling through extremely dense scrub. He didn’t go over the Night Cap and he didn’t go up the beach so he’s getting a bit slow isn’t he? He went and hacked his own way somewhere through from Mullumbimby through to the river and according to an Aunt, which was the usual custom, he scarred certain trees with his own particular cut. You know it’s very risky by the sound of that. he then made a boat, native fashion, and rowed up and down the river for three months before selecting. He was very cautious, but he wasn’t slow. Three months is a long time rowing up and down the river looking for a place – except I took 4 years to buy a house here. He also rowed over what today is Knox Park, so it must have been very different in those days. In those days, it was selection before survey so he pegged the area he wanted and returned to Williams River. In 1867 he brought his mother and two brothers because in the meantime he’d got himself married, but he brought his mother and two brothers which is rather unusual. He did all the work then and he brought the working bullocks and equipment and then he cleared the scrub and built two houses mostly from cedar because that was what was on the property. He then sent for Wilhelmina his wife and her two sisters Margaret and Christina. Now Margaret eventually married John Mc Eachran and Christina married John Quirk so that’s how we are mixed up with the Quirks and the Mc Eachran, but there’s worse to come. They came to Ballina on the ship and we haven’t found that ship yet. They were met there by her brother-in-law John Dinsey, one of the brothers that had come up, who later selected on the North Arm. Later, Margaret and Christina had a store at Tygalgah, opposite the present CSR Mill Manager’s residence at Condong. They even made men’s suits so they must have been very good needlewomen. One daughter later married John Mc Eachran and the other married John Quirk of Tumbulgum. Descendants of both of those families are still living on the Tweed. The trip from Ballina was made on horseback over the Night Cap with my grandfather James Dinsey being carried on the pommel of the saddle, he then being 18 months old. The last night of the trip, they camped at Tyalgum because James had caught the croup and finished the journey next day. My great Grandfather and his two brothers felled the scrub, keeping their firearms handy in the event of Aborigines approaching. They logged up and then with the bullocks they ploughed the ground and planted corn and arrowroot. They ground both the corn and the arrowroot for cooking purposes. 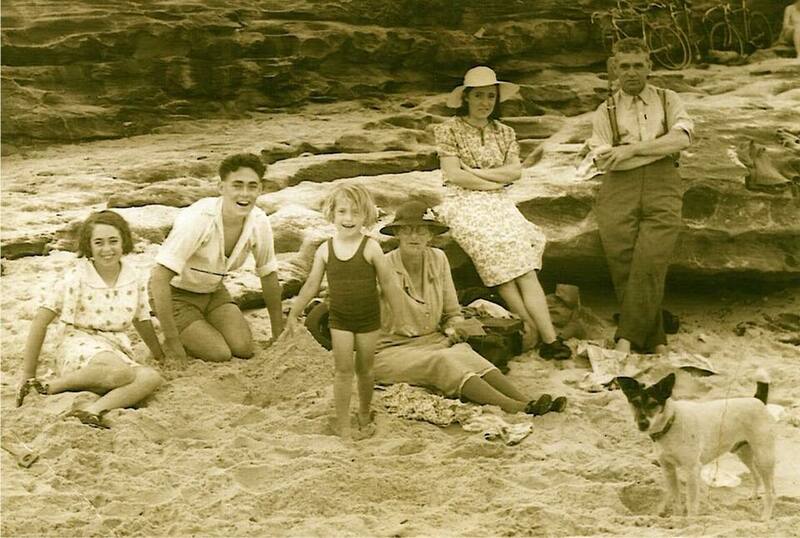 There was no markets for their surplus and money was scarce, so my great Grandfather left his wife and the family while he sought employment on the Brisbane to Ipswich Railway line which was being built just then. Of course they would have had the two sisters to be company. One day a schooner arrived whilst he was away and they had a wharf on the river – everyone had a wharf, and the Captain offered the very good price of twenty shillings per bag for the corn that Wilhelmina had sitting on the wharf. On his return from up river, he loaded the corn and paid my great Grandmother 200 sovereigns. She was over the moon about it I suppose. He took a letter to post in Brisbane to my great Grandfather advising him of the sale and my great Grandfather returned to the Tweed. Natural resources were utilised to the full. One section of the farm at the foot of “The Rock” was covered with natural grasses and this provided good grazing for the bullocks. Luxuries were few but game such as pigeons, wild duck and scrub turkey were plentiful. Fish were of course in abundance. Even peaches were growing in the scrub and the women would place sheets on the shingle roofs and sundry sufficient of this fruit to tide them over until the next season. There was not any fruit fly, which was a great help. Wild honey was always to be had for the collecting. The girls would be very busy I’d say. Lighting was fat from the pigeons with a wick of string to serve as a candle. The mattresses used for beds were a foundation one on a palliasse filled with the softest parts of the cornhusk, which was renewed after each corn season. On top of this would be placed a mattress of feathers. As you can imagine, with game as their main diet, the feathers were in plentiful supply. There is another story about Mrs. Kelly of Eungella who arrived much later and there were a couple of relatives between Condong and Murwillumbah that had land there – Norman Bell and John Bell were their names and they had their little house as well, but Mrs Kelly walked down from Brisbane and they had pack horses – she wouldn’t ride a horse, she walked. She wouldn’t let her mattress go on the horse. It was a feather mattress she’d brought from Northern Ireland somewhere and so she carried it all the way. My mind boggles at the thought of that. when she got to Tweed Heads there was a Mr Scott who took them across the river or up the river and it was eleven o’clock at night when they got up to Mr Norman Bell’s house on the river somewhere near the old 2MW Station, and she said it was “So lovely to see a face I knew, he got out of his bed and I put my feather mattress on his bed and everyone else slept on the floor”. This is a great story, I thought was really gorgeous about mattresses – I’m a bit fussy about my mattress too. On the 24th December 1867, their second child was born at Mrs. Scott’s house at Dry Dock. Does everybody know about that? I’d never heard this before. Mr and Mrs Scott arrived on the Tweed in 1857 and Mr Jack Lillie of Banora Point is a grandson – that’s if he is still with us. I don’t know. A man named Perry bought what is Hibbard’s farm at Tumbulgum from that same Mr Scott. They had a very beautiful garden and brought the first lantana to the district. Of course, it was then a “Garden” variety. It’s only really a “Garden” variety now. I never see any lantana around that used to be there when I was a girl. I used to crawl under it to get the eggs from the chooks. In 1872, the first school was in John Quirk’s barn. Later the school was at Mrs. Logan’s residence. The Quirk’s farm was on the River just up-river from Tumbulgum, quite close, and the school itself (the barn) – there’s an old house there now and that’s where it was – right on the river. The children used to come by boat to it because there were no roads or anything. The first teacher was a Mr. Harris and then a Mr. Gray. 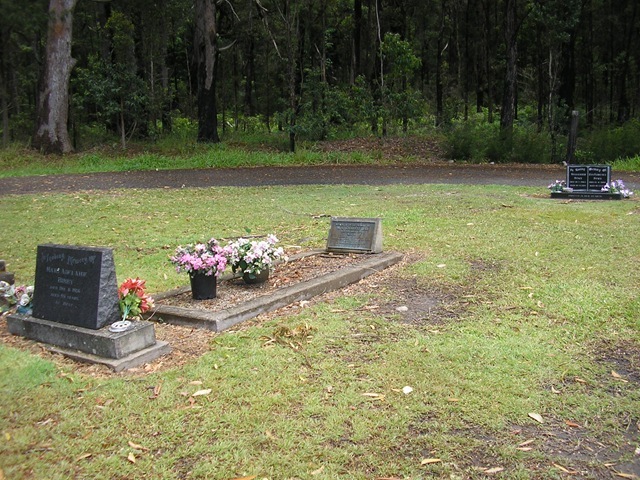 Mr Gray’s grave is on the hill above the quarry now – its where North Tumbulgum quarry used to be just about where the Seventh Day Adventist Church. There was a Hotel there not far away. Later a school and residence was built by Mr John Trute at North Tumbulgum, near the quarry. It had brick chimneys which were still standing in my father’s day. Mrs Mc Adoo was the first teacher in this school. The second school was held for a short time in a room at the back of the Hotel and then John Trute built the new one because they wanted the room back. Going to and from school, the children had to follow the bridle tracks – this was later when the school was across the river – and at the creek crossings, logs were placed there for them to walk across and then they were rowed across the river at Tumbulgum or the Junction. The families attending that school included the Bignall’s, Boardman’s, Cashin’s, Dinsey’s, Kyle’s, Logan’s, Ritchie’s, Skinner’s and Quirk’s. most of those families have descendants still living on the river. Mr Mason and Mr Yansen were also teachers at this school, the latter being the first teacher in the present school on the Southern bank, and then came Mr John Cameron who taught at the school for seventeen years. The first sugar mill on the Tweed was built about half a mile on the Murwillumbah side of Tumbulgum by Messrs. Pringle, Shankey and Byrnes in 1872. cane growing was then considered to be the beginning of prosperity. In those days, the growers cut their own cane. The owners of the Mill stayed for some years before selling to John Morrison whose two sons continued working the Mill until the C.S.R. built at Condong. (I have a worry about the name John – I have a feeling it was another one. If anybody knows, they can correct me). One son, William Morrison remained on the farm until his death in the early 1930’s. He married my great Grandparents second daughter Janet Dinsey. 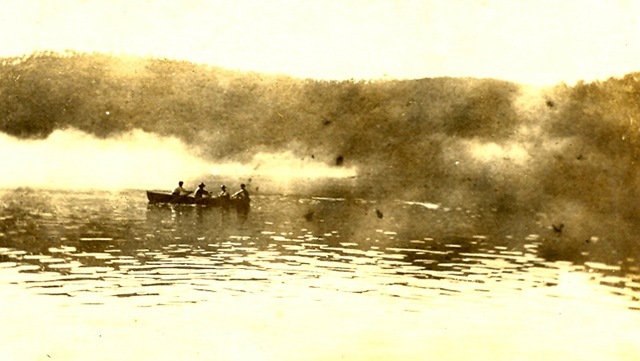 The Pages, my maternal great Grandparents, arrived on the Tweed River in 1880. they arrived out on a ship called the “James Burney” in 1856 – the others had come to Sydney. The Pages went to Ipswich – why, we don’t know and the Historical Society might have Ron Ritchie’s story of early in the Junction because they were there very early in the piece and had the first farm where the Literary Institute or the Hall is now. The Ritchie’s donated that land for the Hall to be built. This was built with donations of timber etc. ; it has since been done over. I have a suspicion that it should belong to the Heritage Committee that the Council has just founded. The Pages farmed on the north bank of the river below Tumbulgum and later keeping a store in Tumbulgum until my great Grandfather’s death in 1904. He was buried in the North Tumbulgum Cemetery with many of the earl settlers. 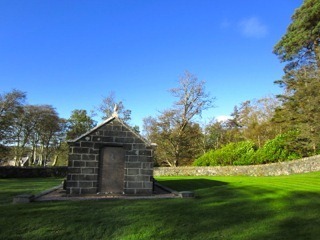 Now, if you’ve been to the first Cemetery on the Tweed – apart from the mosquitoes, it’s a very lovely place in a way. It’s in amongst the trees now and a lot of the graves have been trodden down by the cattle. They restored it through work for the dole and it looks really good. I do not think that Cemetery was there in 1860 but the last burial was around the 1920’s when Mr. Jack Maye of Maye’s Hill was buried there. I do not think any Aboriginals were buried there as they had their own burial grounds, an early one of which my great Grandfather Dinsey’s property just near “The Rock”. The Aborigines also had their Bora ground and they had their corroborees and for years we had a pile of palms and all sorts of trees and my husband remembers them too, when he was young. My Great Grandfather, whose only friend for years, was an Aboriginal boy, did all sorts of things together, trying to raise the horses and things like that. they kept this Bora Ring for the Aboriginals and they had their Corroborees there until such time as my Grandfather died. The trees were still there when I left the place – that would have been 1949. They’ve gone now, they’ve been razored down. My great Grandfather was very interested in sports and the first Sports Meeting was held on his property. He was a keen sportsman, particularly as a cricketer. He organised matches between Tweed Teams and Coomera and Tallebudgera. I’ve come across the old newspapers. The men would come on horseback over the Range, somewhere near Tomewin, play cricket all day Saturday, dance all night and ride back on Sunday. It’s a fair way from Coomera to here on a horse, isn’t it? Then there would be return matches when the Tweed would go to Coomera or Tallebudgera. The last Sports Meeting held on his property was in 1897. It was an M.U.I.O.O.F Sports Day. The people from Tweed Heads and Murwillumbah on Skinner Bros, river boats called the “Uki” and the “Pearl”. The horse races were held on the plain at the foot of the “Rock” and the other sports, foot running etc., and were in the home paddock. Mr. A. Baker selected where the Village of Tumbulgum is now and he and my great Grandfather planted a fig tree each in front of the Royal Hotel. The one Mr Baker planted must have been the victim of erosion. It was nearer the Ferry than the one my great Grandfather planted which is not still standing on the front of the river there, in front of what is now the Tumbulgum Garage. Why I’m telling you that is because it was a great thing to go past this fig tree, but we can’t do it anymore because I think the Council chopped it down to make room for the boats to get in the river. A beautiful tree it was. In the 1880’s the young men used to round up brumbies, which is a horrible thought. They would drive them onto the Peninsula north of the Caves at Fingal. The poor things became cornered there. They had to either go into the sea or the river, or be lassoed. Mr. Harry Clarke and my Grandfather, James Dinsey, are the only ones I understand have participated, but there were many others that probably did the same, but we didn’t know about it. My great Grandfather’s youngest daughter, Mary Dyce, wife of the first Official Postmaster at Tumbulgum, rode one of the those brumbies for years. An oral story that I heard that she rode one up Mt Warning. I have a photo of her on it too. The first Bank on the Tweed was the C.B.S. It was on the riverbank, down river from the old 2 MW building. Mr. Waugh was the first Manager. The bank was later transferred to Tumbulgum where the premises consisting of Office and residence stood alongside the Metropolitan Hotel, the Manager being Mr Charles Budd. The Bank was later moved to Murwillumbah. The first member of the Police Force on the river was Constable Torpy. Mr Tom Lickey had the first cordial factory. This was near where the cattle dip at Tumbulgum was and that is where Mrs Higgins has Dr Smith’s house and lives – right on the top of where the dip was. Tom Lickey sold out to Skinner Bros. 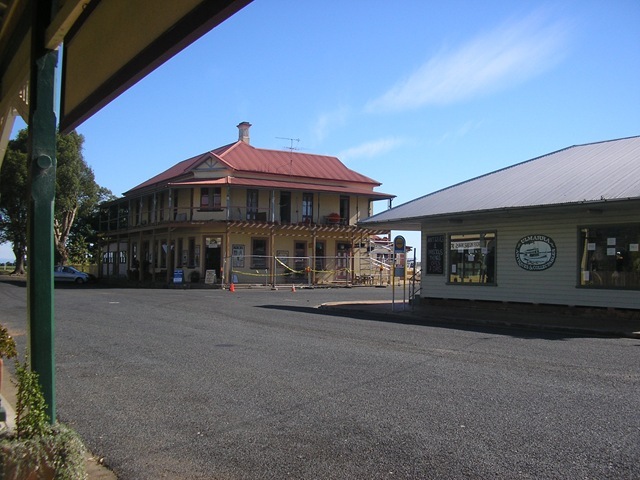 The Royal Hotel was built by a Mr Nixon, a brother-in-law of Mr Joshua Bray, where the General Store stands now. Mr Brett who married one of Mr Pat Smith’s daughters, built the Metropolitan Hotel, then came the Junction Inn built by Mr Collins who founded the first Masonic Lodge on the Tweed, the Masonic Hall being on the hill behind his Hotel at North Tumbulgum. Question: (Joan Smith): Dinsey’s Rock – is that one on the left hand side going towards Murwillumbah? What’s the one on the other side? Answer: (June). That used to be, I understand on John Dinsey’s place strangely enough. He was my great Grandfather’s brother. He selected over there, I don’t know that, that one has a name. Joan: Maybe the whole thing is Dinsey’s Rock – that’s what they mean – John might even know about that. The reason I mention that is because when you’re driving down – I mean Joyce Martyn, my Geography Teacher, told me that, that rock had originally been one rock that the river has just gone through. Answer, June: That might be so – Joyce may have been good at Geology – I’m not. Question – Joan: The Corroboree ground you’re talking about was over near the left hand rock? Answer – June: yes, on the southern side of the river – that’s a much bigger rock than the other one. That’s where they had their corroborees and this burial ground was sort of at the foot of the rock. My grandfather selected 100 acres at first and then he got another 40 acres which went right back to the rock, but the year before the surveyor got there. The Loder family and the Dinsey’s claimed the rock but you know we just did that for fun. Question – Joan: So now that is all under can? Answer, June: Oh yes, its all under cane, but I really don’t think anybody owns the Rock – nobody would want it. You know the magpies used to chase me up there – they were terrible – they’d peck you on the head. Question – Fay O’Keeffe: With the Rock – I have a sort of memory of a local person who is still in the area, applying to build something on the top of that rock, because it’s part of his farm and I think it must have been refused, but a lot of trees seem to have disappeared fro the Rock itself – I think they’d be a bit dry now don’t you. I’ve been watching it over the years and it just doesn’t look the same as it used to – I don’t know what they have done to it – whether they’ve made a track up it or what it is. Answer – June: I notice that it looks different – much barer than it used to be. I don’t know if anybody does own it, but all I know is that when we were living in Sydney an Estate Agent rang me up and asked me if I’d like to buy the rock back again, and I said, “How much”, and he said “One million Dollars” and I said, “Sorry, can’t do”. I often wondered what happened to that. He was an Estate Agent from Surfers Paradise and that would have been in the 1970’s. Question (?) – John Smith: that would have been Laurie Wall – us local people wouldn’t do that. My name is John Smith – I’m old Paddy Smith’s grandson. I remember you when you lived alongside Dinsey Creek, your place right back to Eviron. There was a big rock at Eviron and when I was growing up – I’m a good deal older than you – that was always referred to as Dinsey’s Rock. Next door to you were the Whites – Hills owned the place next door to you and on the Eviron side of it – running right through there from the Highway back to Eviron, the Gills owned and all that property through there and the Gras to the right. Answer – June: Yes, that’s Dinsey’s Rock. Well the other part of my family – well, there’s lots of parts as you know I’ll probably tell you, there are eight Great Grandparents. First of all, I can say, that I inherited George Eric Dinsey and Eva May Coghlan as my parents. My father was of English/Scots descent. My mother was of Irish descent. My childhood was fun as I remember it. Lots of hugs and lots of laughter and rides on draught horses, which was very difficult for a young child. My mother died in 1933 when I was eight years old and so my father and I went to live with my grandfather (67 years) and his sister, Mary Dyce (61 years). My grandmother Rosa (nee Page) had died four years earlier leaving one son (my father) and four daughters, Winifred Rosa, who married James Buchanan, Wilhelmina Sarah, who married Owen Charles, Janet McKay Dinsey who married William Morrison (there are still lots of these people around), Elizabeth Mary who married Denis Keeshan. She went to the Solomon Islands to marry him. He was looking after a coffee plantation. He had been thrown away in a heap in WW1 of the dead and somebody found him and saw his eyelids move and they dragged him out and he lived until he was 93, here on the Tweed. He was lucky to be with us. It was during these early years, living with the adults that I became interested in my forbears, their circumstances, their failures and successes as I grow up, this interest continued with a lot of help from my son Graham. Mark Rogers, who is a descendant of the Quirks and lives in Canberra, my husband Jack, who is with me all the time and rescues me from all sorts of crisis and terrible things, and the representatives on our 1997 Easter Reunion, Marie Toshack (Our Laurie family historian) and Jan (Janice) Morrison, our (McLeod. Mc Kay and Bell families’ historian). This reunion was held at the Murwillumbah Race Track which was really a perfect setting because we had Mt Warning in the background and all the cane was lovely. We had a wonderful time but instead of the twenty or thirty people turning up, we had about four hundred. We then realised we had a lot more relatives than we really expected to have. We then collected most recently Marie Toshack from Gloucester who is telling us of all the other relatives we have down there and Janice Morrison who lives in Sydney – she’s just retired. I think she probably gives you all an E-mail here at the Historical Society, looking for information. So, that is my present family doings. That 1997 reunion brought a question from a Bert Dinsey descendant who I thought had been killed in the War and I’m sure I saw it in one of those War books that came out afterwards that he was killed. This family just came out of the blue from Queensland and turned up, so we had some surprises. One incident in the early years of my childhood was the discovery of the family Bible in which I found a lot of records of births, deaths and marriages. I discovered that the Aunts that I was living with and calling (my grand aunt she was) her Aunt Mary for donkeys years. I found she had another name – Henrietta so I pushed out to tell her about this – I said, “Why didn’t you ever tell me your name was Henrietta?” and she said, “don’t you ever tell anybody that again,” so I’m very careful what I say about what I find out now. I was curious about these names in the front piece of the Bible. There were many names and I wondered if they were still alive, had they all come to Australia or were they living with families in another country and we didn’t know anything about them. So, when I retired I began a research of all these fellow relatives. I found lots, spent too much money on births, deaths and marriage Certificates, stamps and telephone calls, hoping that was worth the time spent. I found some things that surprised me, mostly good things but there are lots I haven’t yet discovered. A few other dedicated researchers have helped immensely. We added to our history and we’ve discovered many funny stories, some that I couldn’t relate to you, some sad ones also and we shared our laughs and tragedies. It was a very great experience. I have decided we should contemplate and plan the future and reflect on the past and let us respect those assets of the past which if assimilated with due care; help us to solve the problems of the future. Remember what we are, for good or bad, what the past made us. What and who are we? We may find part of the answer to this question by delving into our own family history and trying to see what sort of genes were in our parents, their parents and their parents, parents. Each parent owes what they have and what they are to two other people, one step further back into the past. These owed what they were to two other people, your great grandparents of whom, of course there are eight. As first step in the examination of the past, let us try to discover what these eight people were and what made them tick. Try to bear in mind that one of their reasons for doing what they did, whether it was fleeing from the clearances in the Highlands of Scotland or being forced off their land by the English Duke of Sutherland in Scotland or by the Potato Famine in Ireland. Or, casting off the shackles of their old life to try life anew out in the colonies, or whether it was merely trying to be a better person, a better tradesman, a better mother, a better father – was because of us? True, they did not know of our existence as individuals but they did know, as a conviction in their hearts, that one day their children would have children, who would have children. This they knew, that whatever they did to improve their lot to ease their suffering or simply to do their best, would one day benefit their own descendants. In telling, these stories there will have to be a few assumptions based on the meagre information available. We will probably never know the reason why they all came out to the other end of the world – we can only assume that there appeared to be a better prospect for them and their children to carve out a living for themselves. The economic situation, coupled with the Clan system in Scotland and in England, the Class system in the late 18th and 19th Centuries probably meant they could see little chance of their Descendants ever becoming financially independent, vibrantly healthy or well educated. No doubt newspapers of the time (in the way of newspapers of the present) were inclined to exaggerate the possibilities. Perhaps they did not tell of the streets paved with gold but they did relate the experiences of a few who struck it lucky on the gold fields, or as graziers or farmers, or independent business people and perhaps neglected to give equal space to the many stories of misery, privations of distance, no transport, financial loss, the loneliness especially for the women and, of course, half a world away from the family they had left behind, possibly never to see again. We also have to do a bit of educated guess work when it comes to dates, spelling of names and so on. During the telling of these anecdotes, I will not stop to explain the lack of evidence, so if some eager researcher in the future finds that something is ‘wrong’ and feels able to correct it, that will be a positive step forward and they will have my blessing. That is true, when you think of it, they were just stripped of everything. They had one system and then almost overnight they had nothing but they were on the beaches looking for kelp to sell. I think that might have been a big thing of why they came to Australia and Canada. Canada had a lot of people, and America too. After Cilloden, in 1745, the Clans no longer existed as a form of social organisation with their own Gaelic language, culture and landscape. 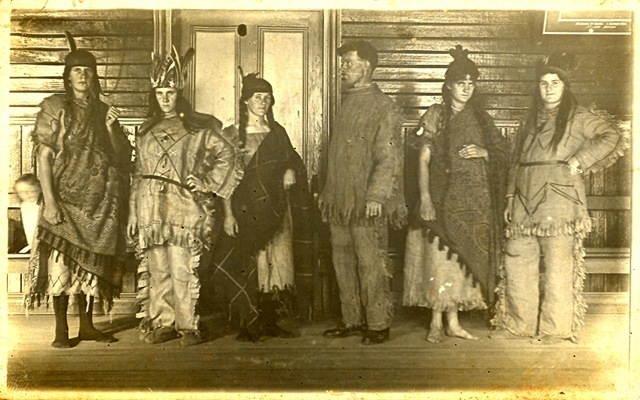 They were virtually tamed out of existence and it all happened so rapidly – within a few decades, when their original character marked by pride, independence and reverence for their Chiefs and their Chiefs had reverence for them too, was completely subdued so tragically and so totally that the clans survive now only in memory. Hence, we have, perhaps, the reason John Dunmore Lang looked to those people to help populate the colony he was so passionate about. The first assisted ships left Scotland in 1837. The “James Moran”, a ship of 600 tons, set sail under Captain Ferguson, from Loch Inver and Loch Broom on 21st October 1838 (These Lochs are right on the tip of North Western Highlands of Scotland). It carried 229 passengers, most of whom were clearance victims. They were brought to Australia under John Dunmore Lang’s Bounty Scheme. This scheme brought over 4,000 Scots to Australia and a large number of Canadians and some Americans too. They apparently flitted from country to country-getting very respectable people. I read that somewhere in this book, so I might be of very respectable Scottish Stock. I’ll have to remember that. The voyage took almost four months – 113 days – sailing direct to Capetown on the way, where it arrived on 26th December 1838. Twenty passengers then left the ship for a new life in Africa and the ship sailed on to Australia on New Year’s Day. The voyage was a happy one. The migrants had nothing but praise for the Master and his crew. A letter of praise was sent to Dr. Boyle, R.N. Her Majesty’s Commissioner for Emigration for Scotland, signed by 30 Captains of the Messes. i.e. those emigrants chosen for their leadership qualities to be responsible for a particular group. The “James Moran” put into Port Jackson on the 11th February 1839. the 210 passengers disembarked, including infants born on the voyage. I have different threads of that ship to tell you about – their relatives. Thread 1. The first lady out was Janette McLeod – I was told that she had been asked to be Chief of the Clan before she left. It would have been the McKay Clan. Her husband died a few years before she left and she had a son Donald. Thread 2. Donald who came out at 23 who was studying to be a Minister of Religion. They were Presbyterians or Free Church – I’m not up in Religions and he had a Gaelic Bible. Thread 3. Ann Sutherland McLeod, her daughter was 20 and Margaret McLeod – Thread 4. who had apparently been on the boarding shipping list but wasn’t on the disembarking one. So, we found by reading a letter of Annie Laurie’s who was buried in the Murwillumbah Cemetery, I don’t know if you can remember it, but I can. It was a huge grave and it had a big tower on it. It was on the right hand side as you went into Main General Cemetery. She died when she was 88 or 89. She was that Ann Sutherland McLeod who had come out on the ship with her mother and she’d married Joseph Laurie of Barrington Tops. I have photos here of “Rordanvale,” their home which we saw last November. There are still Laurie’s living there. it’s a beautiful place high up on the Barrington Mountains. It is a very large home – all cedar – beautiful fire places, but has the most dreadful roof of rusted tin. It looks terrible – spoils the whole look. If I win the lotto I’ll ask them if I can put a new roof on it. We found Annie Laurie’s Will. She left money to her to all her sisters and this Ann Sutherland left money to Margaret McLeod and from that Will we found she’d got off the ship to marry a William McLeod who lived in Thurso – that’s further around on the top of Scotland, not far from that Nuclear Plant that’s up there and the North Sea Oil Wells are just off the Coast. She went back to marry him. She’d made up her mind to come to Australia but she changed it somewhere before they left England, and went back. Thread 5. Wilhelmina McLeod who married a James Bell. There are seven James Bell in the Hunter Valley. We aren’t sure which one is ours. Thread 6. Christina McLeod, the youngest daughter. She was 14 when she came out and she married a man called Jesse Hawkins and if you know the Williams River is not far from the Caitlin Goldfields, so with a name like Jesse Hawkins I thought he might have been an American but we can’t find either of them. So Wilhelmina with those four girls and one boy (5) she was the only one that had any issue and only for her and James Bell with all these Quirks and Dinsey’s and everyone – we wouldn’t be here so we are really proud of Wilhelmina. Joan is winding me up. Have you any further questions. There are some photos you may like to look at. We have a letter written from Tweed Heads in 1896 by the Wilhelmina I’m talking about and we have a copy if you’d like this. Vote of thanks by Robert Longhurst. I would like to thank June on behalf of the Society for a very interesting talk. The amount of research you’ve done is quite remarkable, really a lot of what you’ve been able to document will be of tremendous help to the Society in future. I’m sure everyone will agree it’s been a very, very interesting talk. E & O E. 3 March 2003. JCH. CHECK THE MACLEODS, MCNEILS, MACKAYS ETC OF THE LINEAGE. 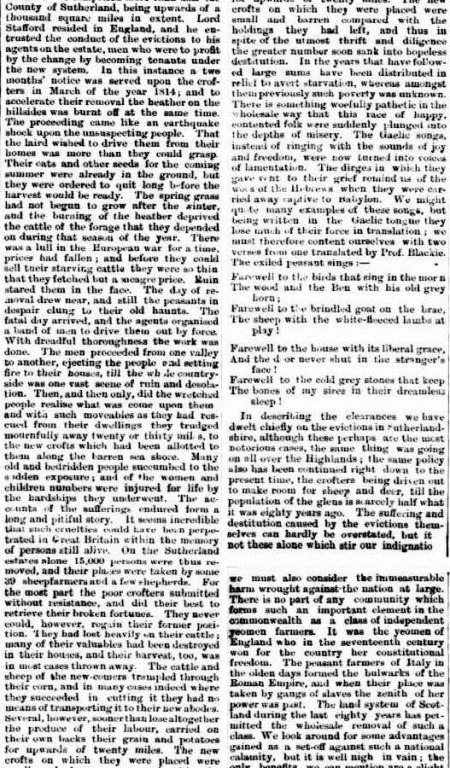 more articles on the CLEARANCES. 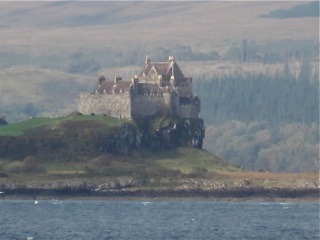 THE CASTLE OF THE MCLEANS ON MULL. Wilhelmina McLEOD : COMPILED BY MARK ROGERS. Wilhelmina arrived in Sydney with her mother, sisters and brother from Keanlochbervie (Kinlochbervie) in Sutherland, NW Scotland on the "James Moran" on 11 Feb 1839. She was 16 at the time of her departure from Scotland. She spoke both Gaelic and English. On arrival in Sydney, the family seems to have been separated and she and her sisters were allocated to servants positions with employers in Sydney while her brother was assigned as a shepherd to Patricks Plains. Sometime after her arrival, the family moved to the Hunter River and she met and married James Bell, a ticket of leave man from Glasgow. They married at the Scots Church in Paterson on 29 Sep 1840. Donald McLeod (her brother) and Mary McMaster were the witnesses. This was shortly before the Presbyterian Church was built at Paterson. Shortly after this the family was working on land at Barties Swamp near East Maitland (1840-41). There is no record in the NSW BDM Index of her marriage or the baptism of 3 of her 7 children. At this time Presbyterian ministers carried their registers with them from appointment to appointment, and it is probable that the register was never handed in after civil registration began. By 1842, she and James worked on a farm at Bandon Grove near Dungog, probably with her brother and mother close by (or on the same property). It appears that they were employed as tennant farmers by the landowners. According to tradition they grew maize and arrowroot for a mill nearby. Mary was apparently born at Bandon Grove about 1842. Both Elizabeth and Christina were christened in Dungog NSW in the Presbyterian Church, and were born at Mt Pleasant, near the current township of Salisbury, further up the Williams River. James died after a severe ilness on Friday 6 Feb 1852 and was buried at Anley’s Flat (Dungog) on 13 Feb 1852. 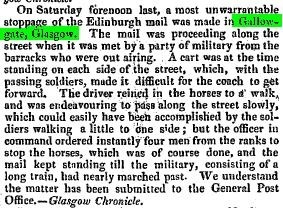 There was an accident on the way to the funeral, which rated a mention in the Maitland Mercury of Saturday 14 Feb 1852. Christina wa baptised on 24 May 1853. 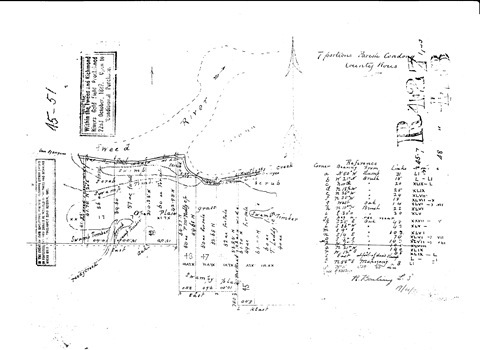 In 1863, her son Norman was definitely still in the Bandon Grove area at "Mulconda". His name, the date and place are in his uncle Donald McLeod’s gaelic bible, now in the possession of Rita Phillips (nee Quirk). John and Norman and their uncle Donald McLeod are listed in a directory of 1867-68 as being at Malconda. Later, by the late-1860s, she may have been farming around Copeland, near Gloucester. One of her sisters, Anne, married a Laurie from Rawdon Vale. Wilhelmina’s son, Norman died at Barrington in 1924 after farming there for many years, although he is known to have farmed for a time in the Tweed. Wilhelmina’s mother Jannet, died in Dungog in 1872, aged apparently 87, and was buried at Anley’s Flat. Her daughter, Ann was the informant. From oral tradition, Wilhelmina did not follow her children or her brother to the Tweed in the late 1860s, so she may have stayed in the Copeland area. 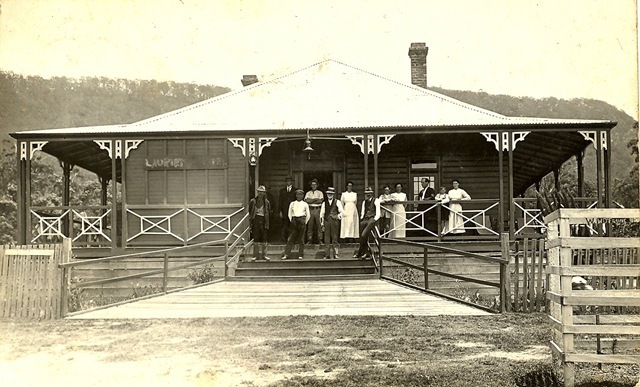 Her son, John and his family lived at Laurieton NSW in the early 1900’s. John apparently spent some time in the Tweed, and Margaret Bell (McEachran) married and settled at Tygalgah on the Tweed, so most of the family may have lived in the Tweed for a number of years from the late 1860’s through to the early 1880’s. LOOKING FOR MARGARET MCLEOD IN SCOTLAND – RESEARCH BY MARK ROGERS. Looking for Margaret McLeod in Scotland. Margaret , daughter of Janet McKay & William McLeod was born about 1817 in Scotland, probably in Kinlochbervie, Sutherland Shire. When Janet & the rest of the family [Donald, Wilhelmina, Ann & Christina] boarded the “James Moran” in Oct. 1838, Margaret did not board with the rest of the family . Oral history was that she stayed to marry her beloved also called McLeod. The will of Ann McLeod dated 1901 leaves50 pounds “to my sister Margaret McLeod wife of Donald McLeod of Thurso Scotland”. Search Scotlandspeople for birth of Margaret MacLeod./all areas. · Marriage 16th March 1855–Eddrachilis, County of Sutherland , at Kinlochbervie. Marriage [ after banns] was solemnized between us according to the forms of the rites & ceremonies of the free Church of Scotland. Signed thomas Fraser, free Church Minister at Kinlochbervie. · BIRTH 19th March 1861,Stromness, County of Orkney. F. Donald McLeod, labourer [General], informant. Parents Marriage 1855 March, Sutherland. · 1881 census Mary A McLeod born 1861 found in Thurso. Mary Ann Mcleod, servant, unmarried ,aged 20, Profession nurse dom. Servant, birth place Orkney, Stromness. Search of Scotlandspeople censuses for Donald McLeod & Margaret McLeod in Thurso. · 1881 Census at Wilson St Thurso. Donald McLeod,Head. Married, aged 66,Gen. Labourer, Birthplace, Sutherlandshire, Kinlochbervie. Margaret McLeod, wife, married, aged 62,House wife, Birthplace, Sutherlandshire, Kinlochbervie. Donald McLeod, head of house, married. aged 66, general labourer, born Sutherland, Kinlochbervie, Gaelic & English. Margaret McLeod, wife, married, aged 72, born Sutherland, Kinlochbervie, Gaelic & English. 1898, Parish of Thurso, in the county of Caithness. Margaret MacLeod, married to Donald MacLeod, Stonecutter. December 2nd 1898 at Bank St Thurso. Female, aged 75 years. Mother Janet MacLeod [maiden Name CLARK ] deceased. 1901 Parish of Thurso, in the county of Caithness. Mary A Davidson daughter present. In Janets death cert. the name of Janets mother was given as CHRISTIAN CLARK also. & in the shipping docs her mothers name is given only as Christian. · Marriage 25 November 1887 St. Andrew, Burgh of Edinburgh. At No. 43 Thistle St, Edinburgh. After publication according to the free Church. F. James Davidson, Cotton Weaver, deceased. M. Mary Davidson M.S. Davidson. F. John McLeod, stone hewer. Despite the incorrect first names for Mary’s parents, I think this is the correct marriage of Mary Ann McLeod. · 1891 census St Cuthberts, Edinburgh. James Davidson, Head, Married, 33, tailor, birthplace Edinburgh. Robert Blair, adopted, 10 months, birthplace Edinburgh, St Giles. · Death 26 August 1931 District of wick, County of Caithness. 2 Whitehouse Lane , Wick. James Davidson, tailor, married to Mary Ann McLeod. Aged 70 years, cerebral Haemorrhage. Informant David Mackay friend. · Death 27 February 1937. Wick, County of Caithness. At 2 Whitehouse Lane Wick. Margaret McLeod , daughter of William McLeod & Janet McKay, did not emigrate with the rest of the family in 1838 on the “James Moran”. 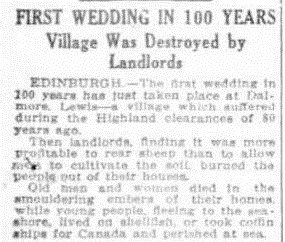 Oral history was that she had stayed in Scotland to marry her beloved Donald McLeod. However the marriage did not take place until 17 years later in 1855. From the marriage certificate Donald McLeod was previously married with two children. There is a marriage of a Donald McLeod to a Janet Mackay in 1834 in Eddrachillis. There is a death of a Janet Macleod in 1855 in Eddrachillis. [ Her age was however 75 ] so that seems too old, but the coincidence is interesting. There are at least 7 births with Donald McLeod as the registered father in Eddrachillis between 1834 & 1855 but no way of determining which may have been the children of the Donald we are interested in. No births were found to Margaret & Donald McLeod in Eddrachillis between 1838 & 1855, nor any found registered in the name of Margaret McLeod separately. There is the birth of Mary Ann McLeod in Stromness, Orkney in 1861. I could not find any births 1855 to 1861 in Kinlochbervie or Stromness that may be other children of Donald & Margaret McLeod. This search was extended to 1875 without result. Donald & Margaret were in Thurso, Caithness by 1881 [ census] & seem to have continued to live there until their deaths in 1898 & 1901. The marriage was found for Mary Ann McLeod & James Davidson in Edinburgh in 1887 [ despite the incorrect first names of Mary Ann’s parents, I think this is Mary McLeod ]. In an 1891 census in Edinburgh the couple had an adopted 10 month child Robert Blair. I could not find further children born to Mary Ann & James Davidson. At some point they moved to Wick, Caithness as they were there at the times of their death in 1931 & 1937. 1891 Census Bank St Thurso. Born Sutherland Kinlochbervie, speaks Gaelic & English. Margaret McLeod, wife, age 72, Born Sutherland Kinlochbervie, speaks Gaelic & English. One room with one or more windows. 1898 Deaths in Parish of Thurso, County of Caithness. 1898 December second, Bank St, Thurso, female, age 75 years. Cause of death Dry gangrene of foot, heart failure. Certified by D. ?Pearson, MB, Thurso. Mary Davidson, daughter present, of ?Wilson St Thurso. Dated 1898 December 3rd at Thurso, Andrew ?, Registrar. 1901 Deaths in Parish of Thurso, County of Caithness. Donald McLeod, stonecutter, widower of Margaret McLeod. 1901 February twenty fifth, 2h 30 am. Bank St, Thurso, male, aged 82 years. Cause of death bronchitis. Certified by D. ? Durran, MB, Thurso. Dated 1901 Feb. 26 at Thurso,? Hanson Registrar. NATIONAL LIBRARY OF SCOTLAND; THE WORD ON THE STREET. In the centuries before there were newspapers and 24-hour news channels, the general public had to rely on street literature to find out what was going on. 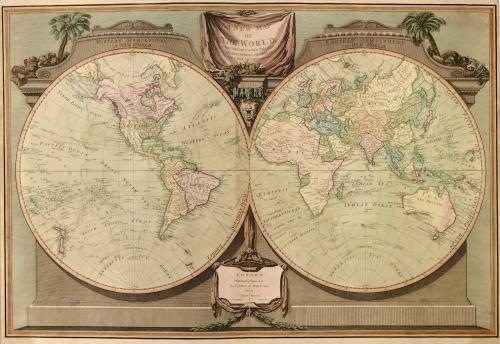 The most popular form of this for nearly 300 years was ‘broadsides’ – the tabloids of their day. Sometimes pinned up on walls in houses and ale-houses, these single sheets carried public notices, news, speeches and songs that could be read (or sung) aloud. THE SAG Newsletter reports that Dr Tanya Evans, now of Macquarie University, is engaged in researching the history of motherhood in early Colonial Australia and Britain between 1750 and 1850. The focus has caught my fancy. My Mind seems to have taken a disproportionate amount of time in recovering from the Change of year and the Summer Season and I haven’t been able to get my mental historical hard drive functioning at all but this little article has begun to bring the ghosts back to life again. Dr Evans is asking for assistance from any who have worked extensively on their family histories and have details of mothers from these early times. Dept of Modern History at Macquarie University, Sydney would have the contact details for you. As for me, it has me thinking of all the Mothers of Mine who and the folkore I have been given. The Scottish Widow who was asked to be Laird of the Clan but came out here with her children instead. 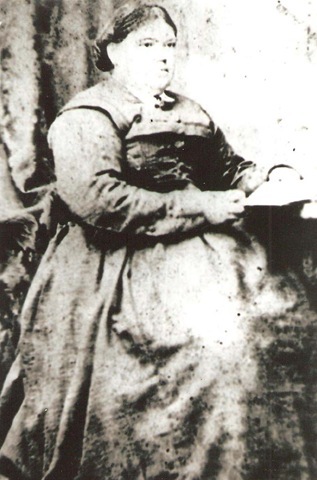 Johannah Ready Prendergast, whose son John was sent as a convict to Government House at Windsor where his mother was Housekeeper. I wonder often about Johannah who was 47 when convicted in Ireland. She tried to have another son and his family sent out but failed. When John’s marriage failed and he became excessively odd in his behaviour and was sentenced to Moreton Bay, Johannah disappears from the records. I like to think she followed him. Ann Moran and Hannah Hutchings/Hitchens. What was it like for them to be mothers here in the early 19th Century ? Young convict women. Ann had 5 children to John Curtis who was already husband and father to a family in England and had attempted to have them brought to him. Hannah was recorded as a ‘ loose woman’ on the convict ship THE BROTHERS. How did her life as a mother develop from that starting point and from the death of her first husband in the Lunatic Asylum, Liverpool ? Caledonian Mercury (Edinburgh, Scotland), Monday, May 7, 1838; Issue 18419. IMMIGRATION AND EMIGRATION MATTERS IN THE LATE 1830s. 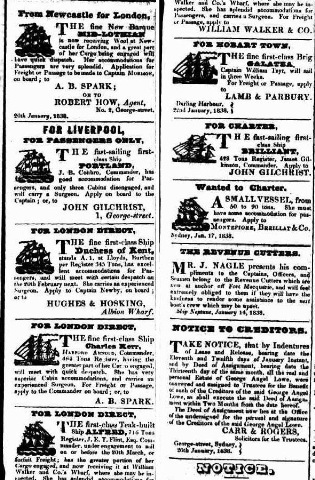 THE NEWSPAPERS FEATURING SOME OF THE ISSUES INVOLVED IN EMIGRATION IN THE 1830s. The John Bells during the 1880s are said to have had a house at Palm Vale on the Tweed and the accident which invalided him. apparently rendering him unable to walk and preceding their removal to LAURIETON, took place in the sugar industry on the Tweed near CONDONG and TUMBULGUM. Mary Ann married John in 1878 in Taree. The Hobart Town Courier Friday 17 November 1837 Supplement: Supplement to the Hobart Town Courier., page 2. With the BRILLIANT due later in JANUARY. 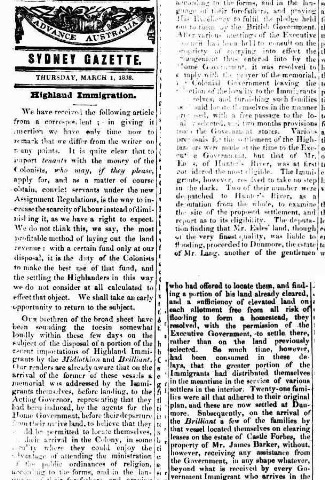 Caledonian Mercury (Edinburgh, Scotland), Saturday, October 14, 1837; Issue 18331.
people who were leaving their homeland under the bounty immigration system. The selection was made by a selecting officer. 320 people embarked on the BRILLIANT and there was only one death recorded. The BRILLIANT was built in MONTREAL in 1834 and was 429 tons. She was taken up by the EMIGRATION DEPARTMENT on August 19 1837 in LEITH . The emigrants embarked in the HEBRIDES. The name of the owner was S PATERSON and she was hired at the rate of 4pounds 17/6 per ton. A. Campbell was the Surgeon Superintendent on the voyage. The BRILLIANT departed on the 27 Sep 1837 and arrived in NSW on 27 Jan 1838. 126 days at sea with a touching at the Cape on 29 Nov 1837. 59 children between 14 and 7. 320 in total with 2 children born on the voyage. The 1 death was that of a child. Publisher: Brown Prior Anderson Location: U.S.A. 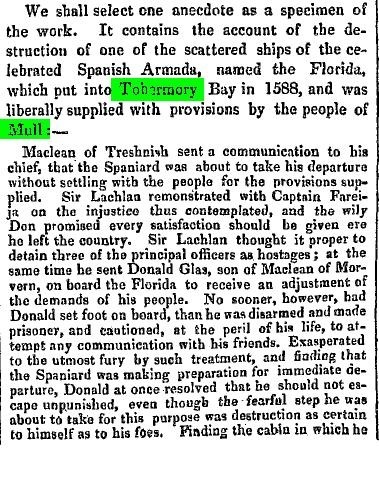 Letters published in Sydney Morning Herald in January 1838 regarding the voyage of the "Brilliant"
NSW State Records film # 1288 SCOTTISH BOUNTY MIGRANTS. John, Elizabeth and their young family came to Australia in 1838 on the ship "Brilliant" and settled in the Williams River area. They later moved to the Clarence River district where John and Elizabeth resided for the remainder of their lives. John McGregor died 28th August, 1888 at Ulmarra, NSW, and Elizabeth on 25th August, 1869, also at Ulmarra. When Victoria Was Crowned; DESCRIPTION OF THE CORONATION OF 1838, BY AN EYE-WITNESS OF THE IMPOSING CEREMONIAL. The death of Mr. Donald Cameron of Port Stephens of which the usual Obituary Notice was inserted in the "Empire" of Friday last deserves a more extended notice than it then and there received. 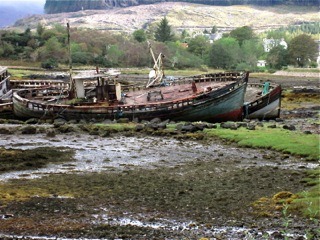 JANET/JENNETT MCLEAN ALSO SAILED FROM TOBER MORY IN THE ISLE OF MULL. OTHER MCLEANS ON THE BRILLIANT. 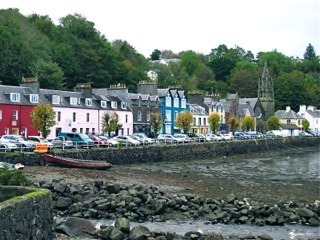 A large body of emigrants sailed from Tobermory on the 27th of September for New South Wales. The vessel was the Brilliant, and its size and splendid fittings were greatly admired. “the people to be conveyed by this vessel are decidedly the most valuable that have ever left the shores of Great Britain; they are all of excellent moral character, and from their knowledge of agriculture, and management of sheep and cattle, must prove a most valuable acquisition to a colony like New South Wales.” The Rev. Mr Macpherson, of Tobermory, preached a farewell sermon before the party sailed. The total number of emigrants was 322, made up as follows:—From Ardnamurchan and Strontian, 105; Coll and Tiree, 104; Mull and lona, 56; Morven, 25; Dunoon, 28; teachers, 2; surgeons, 2. A visitor from New South Wales presented as many of the party as he met with letters of introduction, and expressed himself highly gratified with the prospect of having so valuable an addition to the colony. A Government agent superintended the embarkation. THERE are a lot of MCLEANS on this BRILLIANT trip of 1838. Infectious diseases, chronic illness, accidents at sea, dysentery and diarrhoea, and the debilitating effects of constant seasickness on pregnant women and breast-feeding mothers, all took a toll on passenger numbers. Migrants were not unaware of the risks involved. The loss of babies and infants was considered an inevitable consequence of long seaboard journeys. William Usherwood on board the Beejapore to Sydney in 1853 expressed a common sentiment when he wrote: ‘The … adults are all in good health, we have lost several children but this was quite expected, being always the case’. NORMAN BELL was the older brother of JOHN BELL wife of MARY ANN MCNEIL. They had adjoining land at CONDONG on the TWEED. Their parents were JAMES AND WILHELMINA as noted elsewhere. James was the housebreaker transported from Glasgow in 1831 on the YORK and WILHELMINA was the daughter of WILLIAM MCLEOD and JANET MACKAY who came on the JAMES MORAN in 1839. They married in 1839 at MAITLAND when WILHELMINA was 17 years old. Check in the search engine to the right for further details. 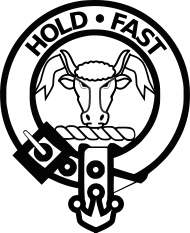 It appears at this time that the Mcleods and Mackays came as a result of the ruthless clearances of the Sutherland Shires in the HIGHLANDS of Scotland. 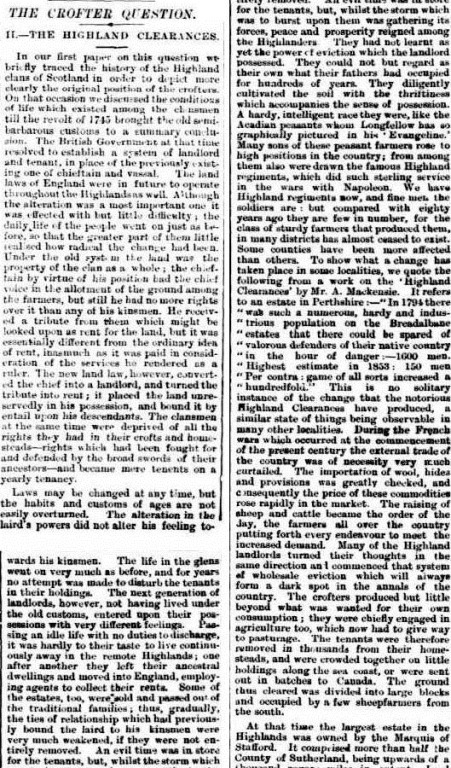 In the 1860s the BELL boys have land on the TWEED. The NSW BDM records indicate that their father JAMES died in 1859( to be verified). I do not know what brought the boys ( and perhaps more members of their family north from the Maitland Area). 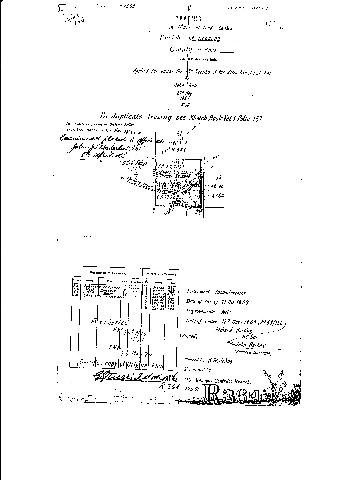 Land is also indicated to belong to WILHELLMINA BELL – mother ? sister ? daughter ? NORMAN BELL was born 1845 and died 15 June 1924 . He is buried in BARRINGTON CEMETERY. His occupations are listed at TWEED RIVER HISTORICAL SOCIETY as farmer/grazier. Whilst on Tweed he was resident at CONDONG. Norman married in 1870 at DUNGOG NSW. His wife was AGNES FRASER HIGGINS and her mother was JANET LAURIE. As my mother used to tell me the BELLS and the LAURIES were ‘tied in somehow”. Her father was JOHN HIGGINS. Agnes Higgins was born at Pt Stephens in 1846 and died in CHATSWOOD, SYDNEY in 1929. From these dates it appears Norman left the Tweed district by the early 1870s whereas John’s Children are born on Tweed between 1879 and 1890 with the youngest being born at Laurieton in the early 90s. Hmm. A rethink required again. There is mention of a MR BELL managing the ABBOTSFORD SUGAR MILL on the TWEED. HOMETOWN OF JAMES BELL. TRIED THERE FOR HOUSEBREAKING IN 1830 AND TRANSPORTED ON THE YORK ARRIVING IN NSW IN FEB 1831. 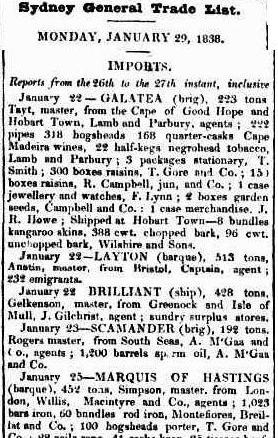 The Sydney Gazette and… Tuesday 8 February 1831, page 2. From New Zealand, on Sunday last, the schooner Currency Lass, with 80 tons flax. From Newcastle, same day, the cutter Fairy. From London, yesterday, whence she sailed the 4th of September, and from Portsmouth the 29th, the ship York (429 tons), Captain Leary, with 200 male prisoners, 2 having died on the passage. Surgeon Superintendent, Campbell France, Esq. The guard consists of 40 non-commissioned officers and privates of the 17th Regiment, who are accompanied by 4 women and 2 children. Passengers, Colonel Despard, 17th Regt., Mrs. Despard and 3 children, Ensign Owen, and Ann Forster and C. Donohoe, servants to Mrs. Despard. SHIPS.- Louisa, Forth, Nancy, Royal Admiral, Clarkstone, Sir George Murray, Dryade, Denmark Hill, Mary Ann, Andromeda, Burrell, Janet hat, Vittoria, Elizabeth, Albion, Resource, and York. BRIGs.-Elizabeth, Wellington, Norval, Couvier Thistle, Governor Phillip, and Lord Rodney. SCHOONERS- Henry, Resolution, Admiral Gifford, Schnapper, Darling, New Zealander, and Currency Lass. CUTTERS-Emma, Fairy, and Letitia Bingham. Total.-Ships, 17 ; Brigs, 7 ; Schooners, 7 ; Cutter, 3 ; in all, 34.
http://nla.gov.au/nla.news-article2198965 The Sydney Gazette and… Thursday 10 February 1831, page 2. 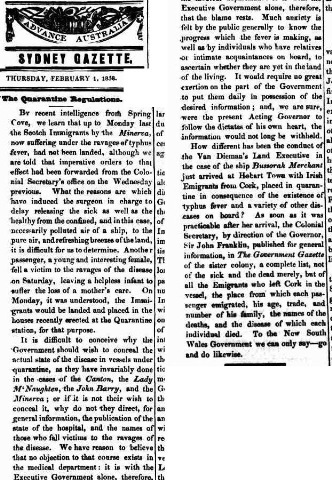 The Sydney Gazette and… Thursday 10 February 1831, page 2. We are requested to correct a mistake which occurred in the notice of the arrival of the ship York (Captain Leary) in our last number. The burthen of the York is there stated to be 429 tons, instead of 478 tons, as appears by the register, -which we bave seen. This vessel is not the old York, as some persons, we are informed, suppose. ; but was built, in the year 1819, at Southwick, in Durham. Captain Leary, the commander, is an old and much respected visitant to this colony. 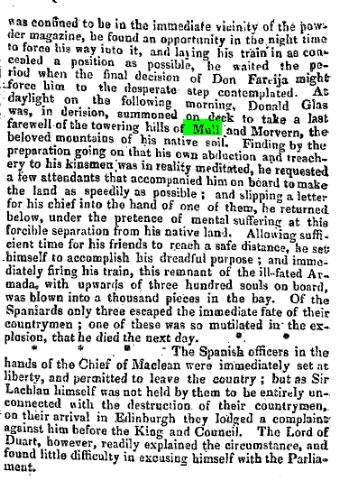 The Sydney Gazette and… Saturday 19 February 1831, page 2. The male prisoners by the York were landed yesterday morning. Among them are a considerable number of strong healthy labourers accustomed to agriculture, who will doubtless prove no small acquisition to the settlers who may obtain them. There are also several good mechanics and tradesmen. The second division of the 57th regiment, will embark on board the York, for Madras, next Thursday. and family ; Lieut. G. Edwards, Lieut. R.
15 women, and 39 children. 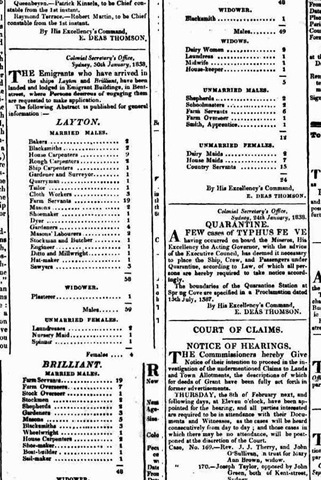 The Sydney Gazette and… Thursday 24 March 1831, page 2. DON’T MISS THIS STORY READ ON : http://nla.gov.au/nla.news-article2199895 The Sydney Gazette and… Tuesday 5 April 1831, page 2. [ POSTSCRIPT, 9 o’CIock, P. M.
so high, that nothing more than a con. calculated to excite, not only in this Co.
dominions to which it might reach. 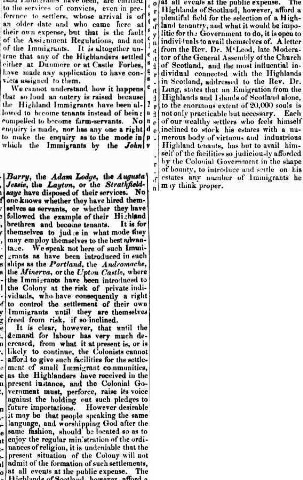 The Sydney Gazette and… Tuesday 12 April 1831, page 2.
as derived from the very best authority. steady from the N. E.
ONCE AGAIN. READ ON THIS IS A GRAND STORY. RETURN OF THE YORK AGAIN! with her rigging a good deal damaged. danger, and how providential her escape. not a dry shirt to their backs for 24 hour. times on the bank at the Sow-and-Pigs. The Sydney Gazette and… Tuesday 26 April 1831, page 3 http://nla.gov.au/nla.news-article2200267 The York is immediately to be hove down, in order to her undergoing a thorough repair, previously to proceeding to sea once more. She cannot, therefore, leave this spot before the expiration of a month at least. The troops disembarked yesterday morning, and marched hack to their old quarters, looking like any thing but pirates, poor fellows ! AND TO FINISH IT OFF FOR THE YORK IN 1831, THE EDITOR OF THE GAZEETE PERHAPS COULD HAVE BEEN A LITTLRE MORE COMPASSIONATE TO THE POET ON THE YORK. 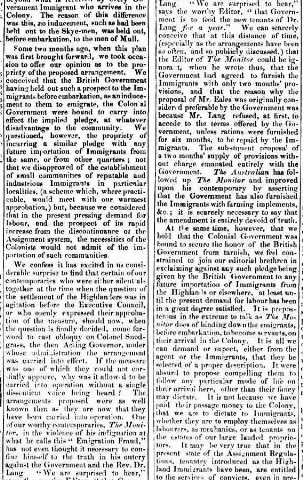 The Sydney Gazette and… Tuesday 19 April 1831, page 2.
published in a day or two. The lines written on board the York are not well measured. Saturday last, will probably appear in our next. Joseph IKIN, 35, b. CHS, M, Ploughs, Reaps, Milks, Sows; T: 1831 from Sheerness to Sydney NSW, Ship: York. John TAYLOR, 23, b. CHS, S, Wheelwright, T: 1831 from Sheerness to Sydney NSW, Ship: York. THE GALLOWGATE. – This street is one of the oldest thoroughfares of Glasgow. Its past history is fascinating, but I shall not pause to dwell thereon. Before the opening of London Street it was one of the chief highways out or into the city. Its leading shops were occupied by prominent citizens who did considerable business, especially among those who came in from the surrounding country districts. In my boyhood its vehicular traffic was considered great and important, and the guard’s bugle notes echoed through it as the mail coach entered the city, especially when bringing tidings of national importance. Most of the 229 passengers on board were clearance victims. They came to Australia under Rev John Dunmore Lang’s Bounty Scheme. 2 people died on the voyage to Australia. The voyage took 113 days, sailing directly to Cape Town, where it arrived 26th December, 1838. 20 passengers left the ship there on New Year’s Day. WILHELMINA MCLEOD emigrated from Sutherland Shire Scotland, with her mother JANET MACKAY , two sisters and a brother on the JAMES MORAN arriving Sydney 11-2-1839. The family moved to the Hunter. James and Wilhelmina married on 29-9-1840 at the Scots Church Paterson. Gun fhios do’n t-sluagh a tha tigh’nn anall. A rinn le’n tuairisgeul ar toirt ann’. From 1815 to 1838 Nova Scotia received approximately 22,000 Scottish immigrants, most of them were from the Highlands and Islands of Scotland. 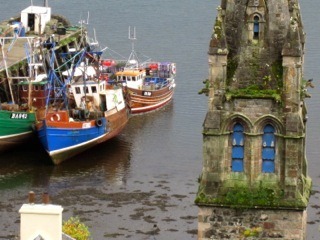 Between 1826-1827, approximately 2,000 Scots left from Tobermory and Stornaway, Scotland for Cape Breton Island. 1835 saw approximately 3,500 departed from Stornaway, Oban and Campbelton. Others came from places in the Highlands and Islands such as Strath Glas, Moidart, Knoydart, Lochaber, the Inner Hebrides, Lewis and Harris, Barra, the Uists, Sutherlandshire and Wester Ross. The BELLS were closely associated with the LAURIES and LAURIETON. SIR,-I notice in your issue of the 8th inst., a letter on the reservation of timber, signed by Thomas Shaw, I believe some of his hints are good, and as this is a matter which concerns many, perchance a hint from one who has had 40 years’ experience may not be out of place. So I will be as brief as possible, and confine myself to a few remarks only. First-The wilful and shameful destruction of timber. At present the law is, that any man holding a license can go on to Government land (except Reserves) and cut away at any tree or sapling he thinks fit. No one has a right to interfere with him, so long as he holds his license ; he is never asked what he means to do with the timber he falls. No doubt you will say, surely no man on earth will fall timber without making use of it. But I can prove to you that it has been done, and that in a wholesale manner. On the Nambucca there have been hundreds of trees, both cedar and pine, cut down many years ago. And they are still there, and will ever remain so, as they are now too rotten for any use. On Camden Haven, a few years ago, the inhabitants took a sudden fit and cut down every beech tree that could be found ; in fact millions of feet, and there it lies, rotting on the ground ; and many a tree of hardwood as well-and yet the people who cut the said timber had no way of removing it to market. So there it remains, a loss to the man who would have used it, a loss to the colony, and a loss to the world at large. And yet the present licensing system allows this wholesale destruction, Surely this system could be improved upon, and before I close I shall give you my idea on the matter, and I hope some of your readers will give a better. Second,-I will now make a few remarks on the reservation of timber. Government has adopted a plan of making a reserve of certain portions of land in various places on the East Coast, for the sake of preserving timber. My opinion is, the plan is rotten in the core. The reserves are made where the best timber is to be found. So far so good. But tell me what they mean by preserving timber that has arrived at its full growth, and every day turning back to its mother earth. This seems to me to be wilful waste, and almost as bad as the men who cut timber and leave it to rot. I may be wrong, but I am against all special timber reserves. I would say, throw it open, and let us have free trade, and encourage colonial industry. At the same time I would make it the special duty of the local constable to ascertain if each man had a license, and what they were cutting for ; see that they mean to use the timber they ore cutting down. And above all, see that no hardwood timber is cut down less than two feet, or six feet in girth, three feet from the ground. This would be preserving timber in the right way ; for timber in this country does not take so long to grow as some think it does, I know large trees that were only saplings thirty years ago ; and at this place we have trees a foot through that were only whipsticks six years ago. And Mr. Hibbard, of Port Macquarie, tells me he knows trees at Shoalhaven three feet through that were mere saplings seventeen years ago (spotted gum). I will now draw to a close, and I trust that some other hand will take the matter up. I have merely given my own opinion, and I think any one who does so deserves a certain amount of credit, let him be right or wrong If I was to go on and state the use and durability of each kind of tree I do not know where I would end. Third.- This much I may say : people must not run away with the idea that because timber is of a certain kind it must be good. Such is not the case. For instance, the ironbark at this place is a poor wood indeed ; at Gloucester, the kitchen at the old accommodation house was shingled with ironbark shingles in the year 1836, yet the roof is waterproof. It depends on the ground and locality where the timber is grown, In the school house, in Port Macquarie, the rafters are saplings, known as the leaf tea-tree ; and although they were put there under the cruel lash and the bitter years of tyranny, yet the said rafters are as sound as the day they were put there. [We need scarcely say that we shall be glad at any time to receive and publish letters such as the above, and we hope the important subject of timber conservation will receive due public attention till amendment in the law and “practice is achieved. James Bell was transported for housebreaking in 1831. He married Wilhelmina McLeod on 29/9/1840 at the SCOTS CHURCH, PATERSON. Wilhelmina was the daughter of WILLIAM MCLEOD and JANET MACKAY and was 17 years old when she married JAMES. Their son , JOHN BELL, married Mary Ann McNeil in Taree on 27th June 1878. At the time John gave his place of residence as RAWDON VALE , district of Gloucester. Roy Burton was told by a now deceased aunt that John’s parents were James and Wilhelmina which we now know to be so. Witnesses to the marriage of John and Mary Ann were JOSEPH LAURIE and MARGARET BELL. Joseph Laurie Snr owned property at RAWDON VALE locality. The witness Joseph Laurie was probably the fifth son of Joseph Senior. (Refer to “EARLY HISTORY OF THE CAMDEN HAVEN” Page 16. The LAURIES.The LAURIES were then living at PEACH GROVE now known as LAURIETON. John’s eldest sister married a LAURIE. His brother NORMAN BELL married AGNES FRASER whose mother was JANET LAURIE and named their daughter JANET LAURIE BELL. When John Bell and Granny Bell left the Tweed they lived the rest of their lives in LAURIETON. 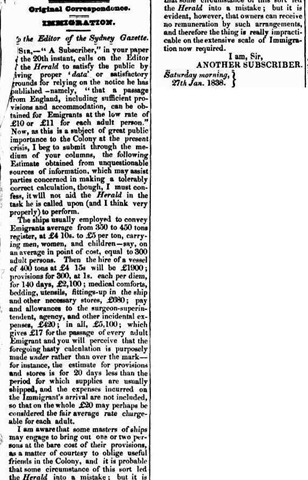 IMMIGRATION REPORT FOR 1852 INCLUDING STATISTICS FOR THE WHOLE PERIOD OF EMIGRATION. VERY DETAILED PROFILE OF IMMIGRATION IN AUSTRALIA. WHERE HAVE WE COME FROM ? allowed to land, immediately after the ship came to anchor, were picked up quite drunk in the streets of Sydney, on the evening of their arrival. This committee report came out the year before Mary Ann and William Sanders came on the VICTORIA. 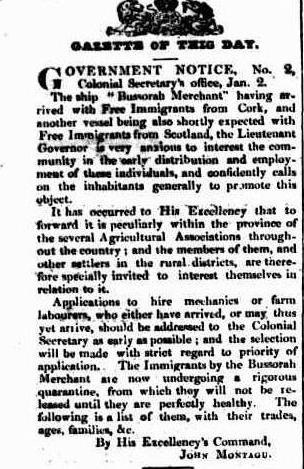 The Government, however, have latterly proposed a measure for the encouragement and promotion of emigration which, if the settlers were at all alive to their own interests and disposed to cooperate in securing them, would be tantamount to the adoption of our original recommendation. For, at a cost for agency which would be altogether insignificant for each individual or family brought out to the colony, the respectable colonists might have seemed through the Government measure we allude to, the immediate introduction of two or three thousand families of virtuous and industrious emigrants of the classes chiefly required in the colony. LIST OF SHIPPING SITES AND EMIGRATIONS. The McLeods and Mackays perhaps from the Sutherland Shire ! 3rd. 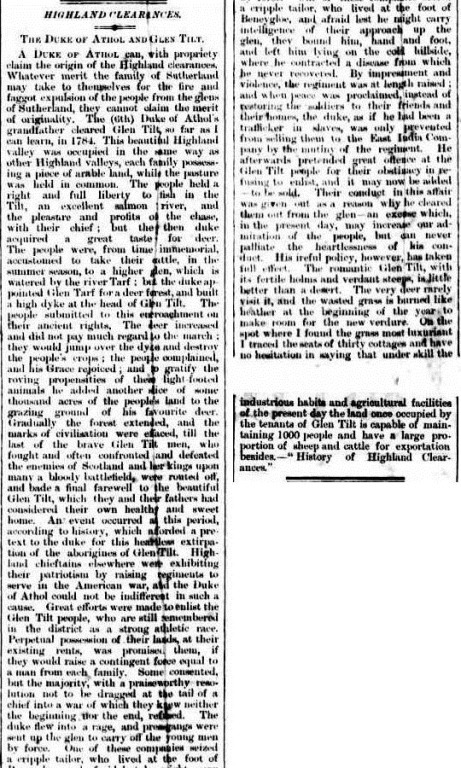 In Scotland, and the north of Ireland, where no such contribution could be looked for, but where the lower classes, being more intelligent, industrious and frugal, would be better fitted for roughing it in a new colony, virtuous and industrious families of these classes would willingly bind themselves to pay that amount from the first of their savings after their arrival ; and if in the event of their purchasing land on credit from the Company, this debt were to be chargeable on the land, its repayment would be secured. Several branches of the families came as assisted emigrants. Wilhelmina McLeod and her mother Janet Mackay with 3 siblings arrived in 1839 on the James Morgan from the Sutherland Shire of Scotland. The Sanders ( William and Mary Ann) came by the VICTORIA in 1849. In 1853, The Jacksons arrived in the WILLIAM BROWN but I don’t yet know under what conditions they came. Also in 1853 the BEEJAPORE sailed to NSW and NZ and on board were John and Harriet Hurrell ( who died in the same year 1853. Many died on that ship and Harriet’s death may well be as a result of the voyage. ) Also on board were the Scottish CRAIGS. The extract below is from a NZ thesis on death and mourning amongst the Scots who emigrated . obvious commonalities in both experiences and responses to death at sea. this may have been as little as one hour. home communities had to be dispensed with in the cramped space aboard ship. interment, effectively denying them the comfort of future visits to the graveside. 1853 WILLIAM BROWN WILLIAM JACKSON AND ELIZABETH JOHNSON (HIS WIFE) WITH ONE DAUGHTER. The Sanders are marked on their disembarkation papers as “assisted emigrants”. 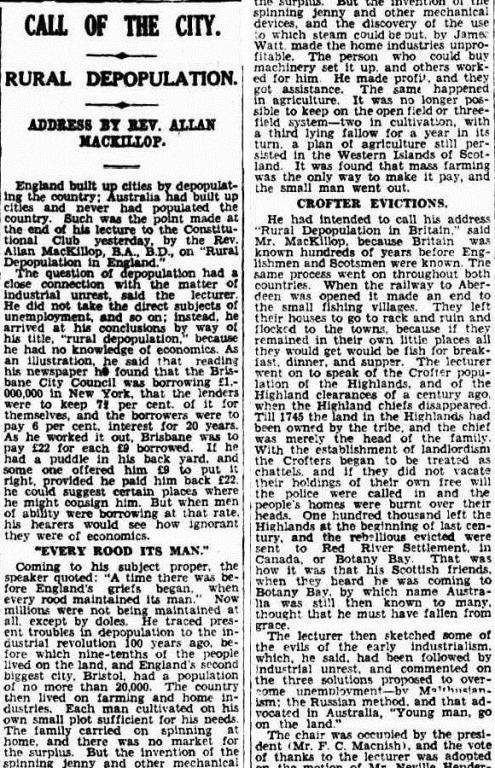 The 19th century newspapers fill in a good deal of my lack of understanding of emigration in the 19th century. I have images of William Sanders and of Mary Ann Skivings Sanders but none of the other ” emigrants”. NSW STATE ARCHIVES REEL 58. ASSISTED IMMIGRANTS INWARDS TO SYDNEY PER SHIP ” VICTORIA” ARRIVED 2nd SEPT 1849. SAUNDERS, William. 26 years. Butcher. Born Kenton Devonshire. Son of William and Elizabeth SAUNDERS- still living in Kenton. C of E – reads and writes. No relations living in Colony. in good health. Complained of short issue of rations during early part of voyage. SAUNDERS, Mary Ann. 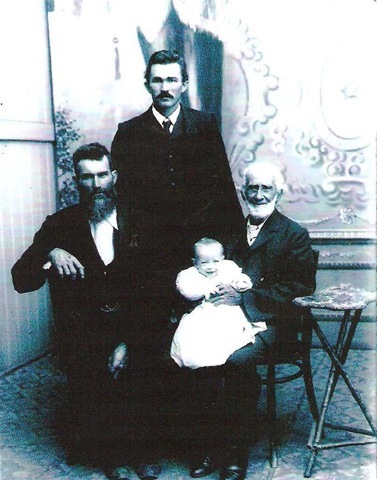 19 years – farm servant – born Silverton Devonshire – daughter of George and Grace Skivings. Still living in Silverton. C of E – Reads and Writes – no relations living in Colony – in Good health. THE JACKSONS. from READY OR NOT – compiled by PHIL READY. On 17th May 1853 a sixty ton ketch, WILLIAM BROWN, had arrived in Sydney from Honolulu. Aboard were immigrants WILLIAM JACKSON and his wife ELIZABETH and one daughter. William who had been born in Nottinghamshire in England was a Coppersmith by trade. On 26th November 1849 , in London he had married EIZABETH JOHNSON who had been born in Norfolk England. In 1853 William whose trade was very much in demand set up in business in Steven Street, Ultimo. The following year his address appeared in SANDS directory as BAY STREET GLEBE. Julia from whom I descend was born on 5th June 1860 – listed as Newtown. WILHELMINA MCLEOD who came from SUTHERLAND SHIRE with her mother and siblings : JANET MACKAY. THOMAS CRAIG a lad of 8 and his family. I have been reading about Sutherland Shire. Wilhelmina McLeod came from there with her mother Janet Mackay and her sibling in 1839. This brings in the highland blood . Findhorn is very close to the Sutherland Shire. ELIZABETH CRAIG SANDERS WITH THREE OF HER CHILDREN. CLYDE, DORIS AND VERA. GEORGE READY SNR IN HIS STEAM TRAMDRIVERS UNIFORM LATE 1800s. and as for SLIM DUSTY and us. Avoca and District Historical Society Inc. This site is not really meant for public consumption. It's a seeking of my own through the Golden Threads of Family but if you choose to proceed, please excuse any inaccuracies or obscurities. If I err, please let me know. If I offend, please let me know. I shall then determine what action to take. If you are able to assist, as so many of you have already, your help will be gratefully accepted. The accuracies and academic certainty of the professional and expert are not my domain. Mine is the rambling research of a novice. If you have helped already and I have not acknowledged it, I apologise right now. Let me know and I will remedy that matter. There are many far more expert and longterm Colonial and Genealogical webmasters out there than I am and I link to them as I encounter them because they are splendid. The Electronic Era has turned all the lights on in a room where our predecessors searched with a flickering candle and at great expense. If you choose to proceed, then do join me in a one way rambling ticket into my Unknown . Yrs Lynne. HISTORICAL SOCIETIES, MUSEUMS , ETC . Philip Andrew Hurrell Just to let all to know that we are organizing a Hurrell family reunion on the 3rd of September which will be held at Comboyne showground starting at @11.00am. We would love to meet as many descendants of Lucy Jane Sanders who is the sister of my Great Grandfather Thomas Dennis Hurrell. if you need any info on the day please contact me on 0451308018. Cheers and hope to meet many of you there, Phil. Learning to stumble through life without the comfort of booze. Our community of Harley Street therapists provide a high quality private therapy service to improve mental health and wellness within a discreet and beautiful environment. Singapore to New Zealand - 12,000km by human power!